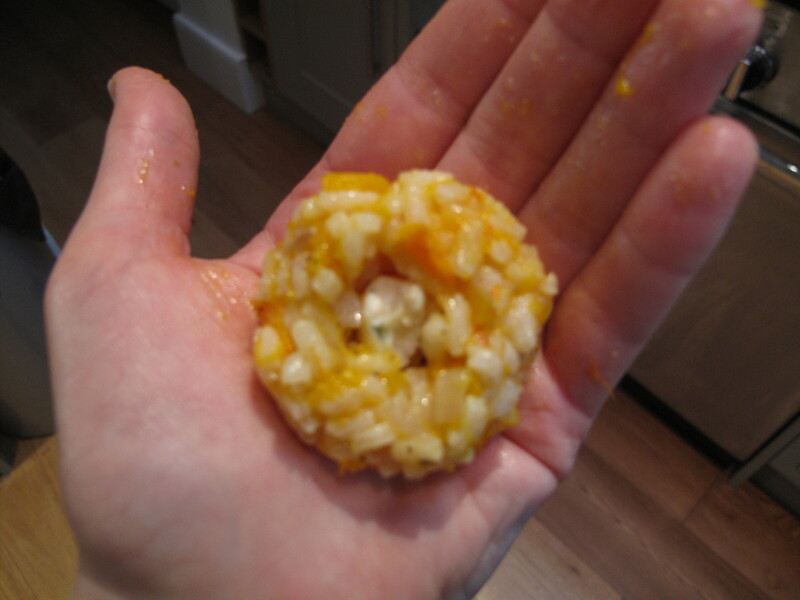 Arancini roughly translates from Italian as ‘little oranges’ which is what these little stuffed rice balls resemble. 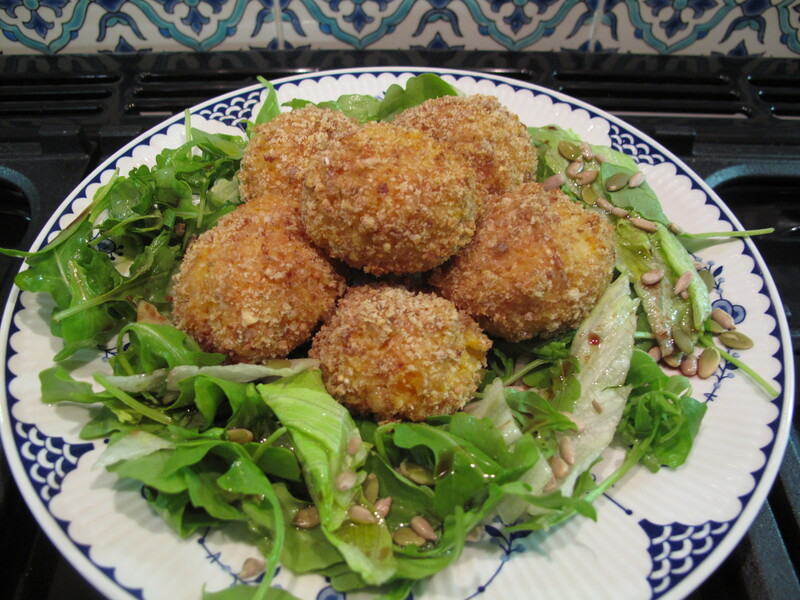 Traditionally eaten in Sicily, arancini are balls of sticky rice, stuffed with fillings such as ragù, cheese or vegetables and then coated in breadcrumbs and fried. 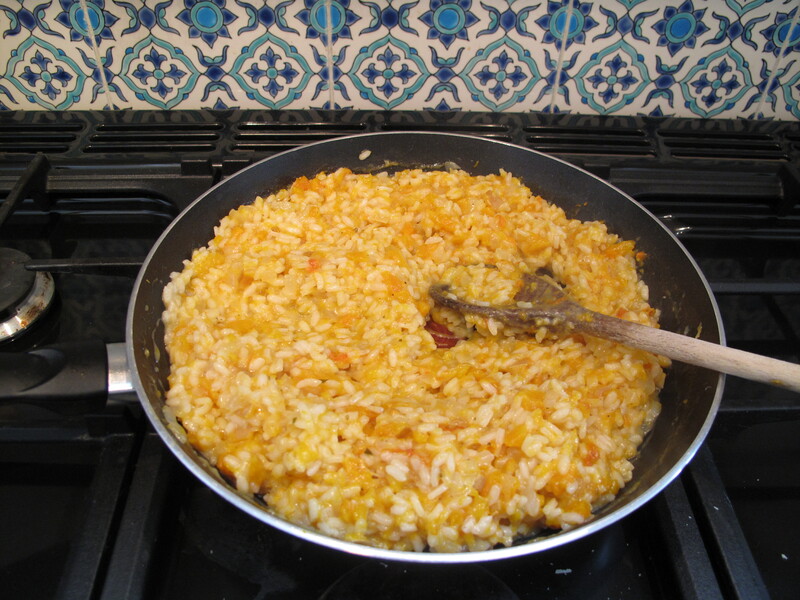 It doesn’t seem to matter how much weighing and measuring I do when I cook risotto, I still end up with enough to feed an advancing army. I also have a violent aversion to defrosted risotto; there’s something just so soggy and sad about it. So when my latest batch of squash risotto resulted in a spectacular surplus even by my standards it seemed an ideal opportunity to make arancini and marry the sweetness of the squash to the sharpness of a blue cheese stuffing. This recipe will make about 20-25 balls. 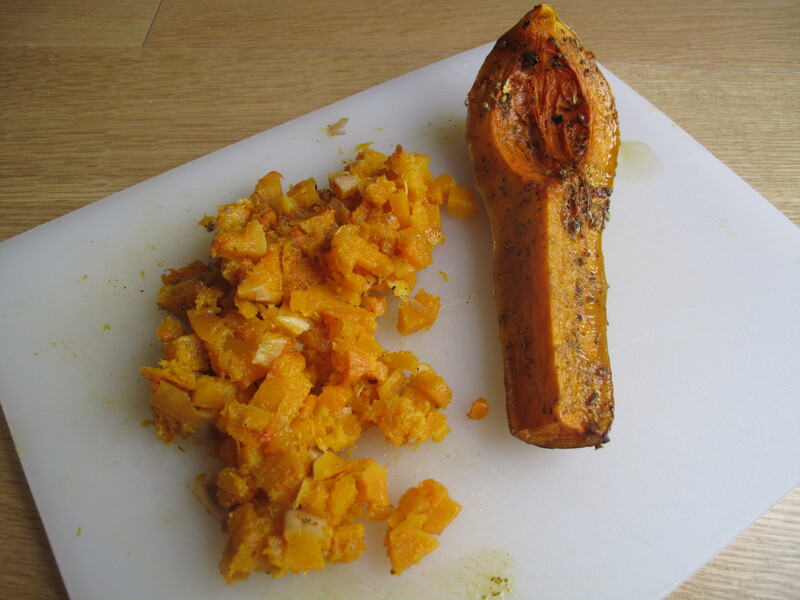 Plain roasted squash can be a bit bland so I like to smear it in a few herbs and spices mixed with olive oil before cooking. For this recipe, I used two crushed garlic cloves, ½ teaspoon of crushed fennel seeds, 1 tsp of dried oregano and plenty of freshly ground salt and pepper. The squash takes about 45 minutes to roast at Gas Mark 6 / 200˚C / 180˚C fan-assisted. Leave it to cool down and then chop into small pieces. Fry the onion in the olive oil for a few minutes and then, when it’s nice and hot, add the rice and stir for a minute or so to ensure that the rice is coated well in all the hot oil. Tip in the glass of white wine and stir for a few minutes more until it has all been absorbed by the rice and then keep adding the stock, a little at a time, stirring all the while, until the rice is cooked. This will take about 20-25 minutes and the rice should be soft on the outside but with a slight bite in the middle. Stir through the Parmesan and the chopped squash and leave to cool. 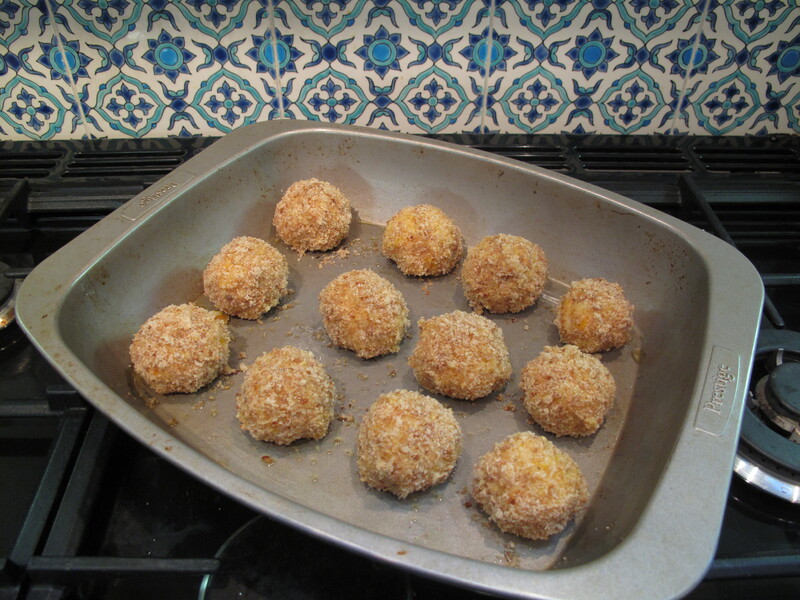 Take the cooled risotto mixture and form into small balls, about the size of a golf ball. Make an indent in the middle with your finger and then stuff in a piece of blue cheese such as gorgonzola or dolcelatte (if I was to make this again I would put in more cheese than you see in the photo below). Close the hole with rice then roll in beaten egg and fine breadcrumbs. You will need 2 eggs, breadcrumbs from about three slices of bread and 75g of blue cheese for this recipe. Traditionally arancini are fried and recipes call for either shallow frying until the breadcrumbs are all evenly browned or deep-frying in oil. I baked mine in the oven for 20 minutes at Gas Mark 6 / 200˚C / 180˚C fan-assisted. They came out perfectly – crispy breadcrumbs on the outside and fluffy rice on the inside with a burst of blue cheese filling. They would be delicious as a snack or party food but we ate ours for supper with a green salad and some toasted seeds. Oh – and a nice glass of white wine.